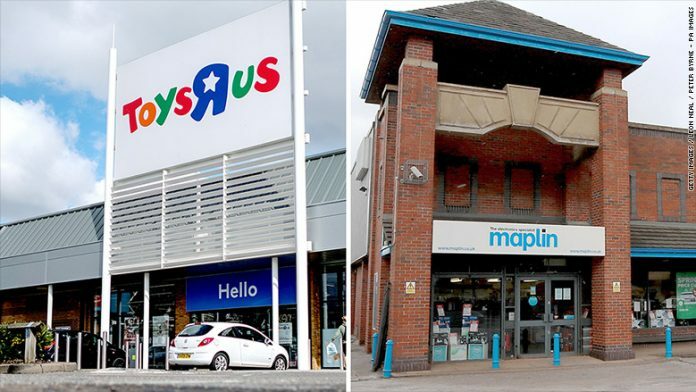 Toys “R” Us and Maplin have gone into administration in the UK, putting about 5,300 jobs at risk. It’s a very dark day for British retailers and their workers. Toys “R” Us and electronics chain Maplin have collapsed in the UK, putting a combined 5,300 retail jobs at risk. Administrators were appointed Wednesday to run both businesses after executives failed to find buyers. Toys “R” Us is one of the UK’s largest toy retailers with 3,000 staff and 105 stores across the country. Maplin employs just over 2,300 staff at more than 200 stores, selling electronics, tech toys and smart-home devices. Investors took fright at the news, selling off shares in some other British retailers. Mothercare, which sells maternity and baby products, saw its shares plunge 10% in London trading. Insolvency specialist Moorfields Advisory has been put in charge of winding down Toys “R” Us, closing stores and selling off assets. The collapse into administration follows Toys “R” Us filing for bankruptcy in the US in September under the weight of $5 billion in debt. Stores will remain open until further notice, and no decision has yet been taken on how many will eventually close, said Simon Thomas, a partner at Moorfields Advisory. But many Toys “R” Us staff were likely to be affected, he added. Toys “R” Us is also closing stores in the US. The company’s lawyers said last month that the decision to shut stores in the company’s biggest market was prompted by increased competition and a shift by customers toward online shopping. The company has operations in 33 countries around the world and over 1,500 stores, mostly in the US. Moorfields said the appointment of administrators to run the UK business would not affect stores in other countries. Consumers are increasingly shifting to online retailers like Amazon (AMZN). Almost 20% of British retail sales are now made online, up from 10% in 2013, according to new government statistics. Toys “R” Us and Maplin, in particular, were fighting an uphill battle as consumers feel increasingly confident about buying many of their products without seeing them first. Maplin went into administration after suffering a slump in sales and running low on cash. PwC is in charge of winding down the business and trying to find a buyer. “Our initial focus as administrators will be to engage with parties who may be interested in acquiring all or part of the company,” said PwC partner Zelf Hussain. Maplin CEO Graham Harris said the economic fallout of 2016’s vote for Brexit had made life even harder. Consumers in the UK have been squeezed by a spike in inflation, driven by the weaker pound since the Brexit referendum, and stagnant wages. “Retail sales growth was broadly flat at the beginning of the New Year with the longer term picture showing a continued slowdown in the sector. This can partly be attributed to a background of generally rising prices,” said Rhian Murphy, a senior statistician at the UK’s Office for National Statistics, earlier this month. “This latest shock in the retail sector continues a worrying trend for our shopping streets and centers. The government must urgently meet with both the unions and the companies to ensure that these jobs are safeguarded,” said party spokesperson Rebecca Long-Bailey.